This card cannot be Normal Summoned or Set. 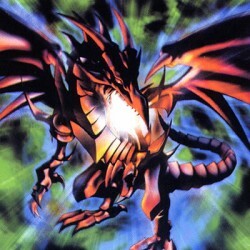 This card cannot be Special Summoned except by Tributing 1 "Red-Eyes B. Dragon" on your side of the field. Increase the ATK of this card by 300 points for e..
A very beautiful dragon covered with Sapphire. It does not like fights, but has incredibly high attack power.".. If this monster is destroyed and sent to the Graveyard, this monster is Special Summoned with an ATK and DEF of 1000 during the End Phase of the turn. This effect can be used only once during the curr.. This monster gets the following effect(s) while there are monster(s) with the following Attributes(s) on the field. - FIRE: Increase the ATK of this card by 500 points. - WIND: If this card destroyed .. When this card is destroyed and sent to the Graveyard as a result of battle, you can Special Summon 1 Dragon-Type monster with an ATK of 1500 or less to your side of the field from you Deck. Then shuf.. Counting from your opponent's turn, none of your opponent's monsters can attack for 3 turns of his/her own. When this card is activated, opponent's face-down monsters at that time are turned face-up, ..